White Spectralids (白シジミ?, lit. 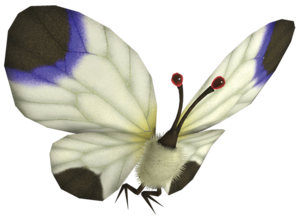 : "White Clam") are small butterfly creatures in Pikmin 3 and Hey! Pikmin, acting as new versions of the Unmarked Spectralids from Pikmin 2. They have white wings, very fuzzy bodies, red eyes and two small feet they use to stand on things. They are very aesthetic, and will fly around any level and land on almost any surface, usually flowers, Pellet Posies, or the eyes or back of a sleeping Bulborb. Compared to other Pikmin 3 flitterbies, this one has white wings, with a purple and black circular pattern on the tips, for the top wings, and without the purple on the bottom ones. Unlike other Spectralids, this type of flitterbie drops nothing. To compensate, in Pikmin 3 it is found near the landing site and the Blue Onion, meaning their retrieval doesn't normally take much time. This is a good (albeit slow) way for players to farm seeds without needing to stray away into more dangerous zones. In Hey! Pikmin, they only appear in a cutscene in The Burning Sky and don't have a log entry, similar to Yellow Spectralids. Because of this, it is unknown if these are the same creatures as in Pikmin 3. They probably are though, due to their appearance and behavior being strikingly similar. In fact, the only major difference is that the purple rings near the tops of their wings are larger and brighter. White Spectralids may be seen on the ground, nearby flowers, or the back of a sleeping Bulborb, but in all cases, when a leader or Pikmin approaches them, they will fly away. They will flutter around aimlessly in the air, and while doing so they are difficult to reach. After the leader moves a considerable distance away from the Spectralid, it will return within 10 seconds. In Hey Pikmin, one is found flying close to the ground, and soon after lands on a nearby stone. After Pikmin lunge towards it, it flies off and disappears. A White Spectralid seen through the KopPad. Screenshot of some White and Yellow Spectralids on a Red Bulborb. The only White Spectralid in Hey! Pikmin, in a cutscene at The Burning Sky. The White Spectralid is the only Spectralid in Pikmin 3 that doesn't appear in Mission Mode. In the Garden of Hope, the game files specify 4 of them, while only 3 can be found. It's possible that it is out of bounds, similarly to a Yellow Spectralid which is also unreachable but can be seen. This page was last edited on January 23, 2019, at 21:18.